Thursday March 9, 2017: Eli lets Julie know who he really is, Chad meets with Deimos' antiquities dealer, and Steve saves Kayla's life. At the square, Paul tells Sonny he did some digging and learned Deimos is stealing artifacts from other countries to sell them. They just need proof. Sonny suggests he get close to Deimos, which worries Paul. From the DiMera mansion, Chad tells Abigail he and Andre are going to steal the stolen antiquities from Deimos and sell them. Abby points out that’s a crime but he calls it a “victimless” one. They kiss as Gabi walks in. It’s awkward. They gals go off to belly dancing while Chad takes a call from Andre, who says Deimos’ Bulgarian antiquities dealer, Grigor, is in Salem to meet Deimos. Seconds later, Grigor, (played by George Tasudis), is sitting with Chad and listening to his offer to buy the antiquities and put them in a museum until he can get them back to their rightful owners. Grigor can see like Deimos, Chad’s in it for the profit. Chad remarks that he will get a reward which will be worth more than the artifacts themselves once he returns them to their owners. Grigor can see Chad’s got integrity but refuses him so Chad asks him to wait. He has something for him. He goes to the foyer to get a folder when Gabi and Abigail walk in, in their belly dancing costumes. Grigor hears talking and walks out. Is this his surprise? Two dancers? A smile plays at his lips and Abigail says he’s right. They’re there for him! He assumes Chad did his homework and learned that his wife who passed away was a belly dancer. They head into the lounge and the women dance. Grigor’s so impressed he decides to dump Deimos and go with Chad for his business. Steve finds Hal with a syringe up against Kayla’s neck in his hospital room. Kayla confirms it has epinephrine in it. It could stop her heart. Steve tries to calm Hal down. Joey arrives and Steve holds his son back while Hal demands a new liver. Stat! Kayla explains even if she could get him a liver, she can’t control the outcome of surgery. Hal drags Kayla to the nurse’s hub and spots Jade, who appears shaken up by the scene. He explains that he feels Kayla botched the surgery. Jade yells that everything that’s happening is his fault. “You were drunk and you were mean.” She thought there was a chance he could finally be a father to her. If he does this, he’s out of her life. Hal weighs his options and puts the syringe down. Steve grabs him and a cop turns up and cuffs the man. There are hugs of relief all around. Kayla gives a statement to the cops, telling them Hal’s reaction was likely due to the anesthesia. Steve questions her and she tells him she did it for Jade. Kay asks why he returned and he tells her about his meeting from Raymond who confirmed that he and Ava had a son who is alive. Kayla looks stunned. At the pub, Eli’s angry with his mother for keeping his father from him all these years. Valerie calls it a difficult decision to keep this from him. There were times she wanted to tell him. He calls her one of the most selfish people he knows. Val insists she was trying to protect him. Having Scotty never kept him from leaving. Eli says he’s staying in Salem – where his family is. Julie arrives. He gives his mom a chance to come clean and when she doesn’t, Eli tells Julie he was moved by her words about her son David at the memorial. He seemed like a great person. Eli comes out and says he’s Julie’s grandson – David’s son. Julie’s shocked. Val confirms it. Julie realizes there’s a resemblance. She’s in awe but turns on Val, asking how this could happen. 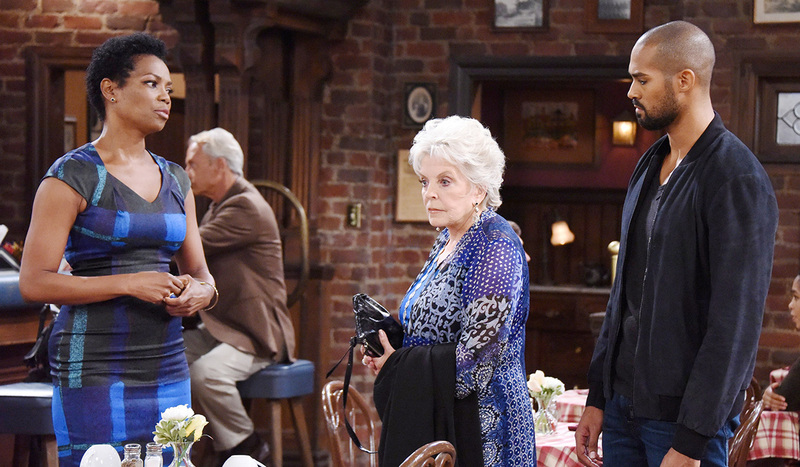 Val’s emotional as she explains that her friend Terrance offered to care for Eli when David left them. Julie asks if Terrance was good to him. Eli calls the man his hero. Julie’s grateful for that. Val apologizes but Julie can’t hear it. She rushes out with Eli after her. They pass Abe who holds Valerie, asking what just happened. Val explains as she sobs. Sonny arrives at the Kiriakis mansion and eavesdrops on Deimos on a call with Grigor, and learns his deal was broken. Deimos is pissed. Grigor threatens that if anything happens to him, all evidence he has against Deimos will be released to the ISA. Eli finds Julie sobbing in the park. She tells him that she was so sad about her son’s death but now her heart is so full – of him. They embrace. Steve tells his family about his huge news. Chloe gets an ally she wasn’t expecting.